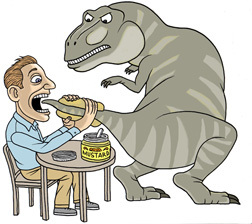 What did a T-Rex Taste Like? Believe it or not, we actually have was of finding this answer despite the fact the Tyrannosaurus Rex has been extinct for over 65 million years. We can determine a T-Rex features, including taste, using similar features (which we now know are called homologous structures). shared with animals the T-Rex is closely related to. Recall that yesterday we learned that the more features you have in common, the higher the probability that you share a common ancestor/DNA (the exception would be convergent evolution where two species become increasingly similar despite the fact the originated from different ancestors). So what we can do is plot relatedness, based on characteristics, on a graphic called a cladogram, like the one shown here. So Today, that’s exactly what we’ll be doing, using the link at the top of this post, you’ll follow the steps to learn how cladograms are created, organized, and what the different branches of it mean. By the time you are through, you will know what it tastes like to bite into a big fat dino-burger! This entry was posted in Honors Biology. Bookmark the permalink.